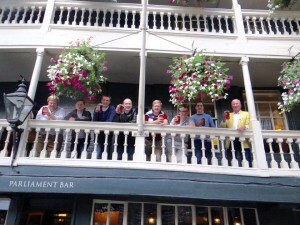 The George Inn & Bermondsey Beer Mile London. 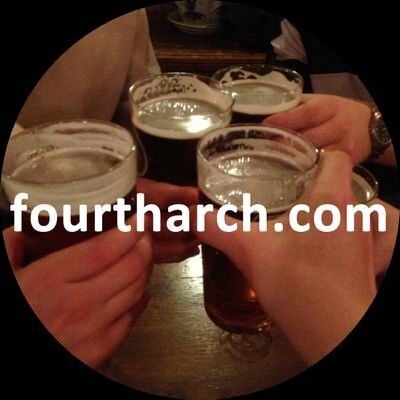 The seventh fourtharch outing was held at the above establishment on the afternoon of the 12th September 2015 and was chosen by Steve. For any prospective new members this is an annual event to meet at a favourite hostelry discovered and chosen by one committee member anywhere in the UK. Congratulations to committee member Gez upon his promotion to Sports Editor of the Bath Chronicle and to new member Chris upon his recent marriage. We made sure we did not step on anyone else’s turf or territory in the London underworld or London underground as it is better known where a jobs protection racket had made the tube drivers rich [50K a year] these boys had the power to hold the city to ransom and were at present in negotiations to establish where their drivers were to sit in the proposed new driverless trains – well they still had a fireman on the footplate of diesel trains during the British rail days. Ruling over all this was Big Boris and his organisation Transport for London, an umbrella group hiding its operations behind a “legitimate” business front involving hire bikes or Boris Bikes locked up in rows around the city and never used. We took the opportunity to use the underworld train [with drivers at the moment] and upon arriving at Bermondsey tube station we asked the heavy at the ticket barrier to pass on our good wishes to Big Boris as a mark of respect, we then walked around to Southwark Park and the old band stand where we sat down to see where we stood. It was now 1.45 and while demolishing his Mexican street food Mogi called the agent again to say we were near the safe house and if it were now possible to move in, Mogi had his speakerphone on in order to eat and talk at the same time so I was able to hear the reply of “2pm mate” once again. After walking the short distance around the park we were soon standing outside the hide out, a three story house built around the late 1980s I would suggest and perfect for the job, suddenly Mogi noticed a duster being shaken through an open window, it was now 1.55 pm and so he rang the doorbell to which a voice inside with an Eastern European accent shouted “2-o-clock” and indeed at precisely 2pm the door was opened by a rather attractive young lady with the keys who told us that she was the cleaner – that’s not the Harvey Keitel type “cleaner” or the one that didn’t turn up to torch the farm the great train robbers hid out in but a regular cleaner that Mogi instantly fell in love with. The house had a well-equipped modern kitchen that we would not be using, two bathrooms and a series of bedrooms throughout the three stories and unlike Mogi’s attempts to negotiate with time, Steve had negotiated a very good price with the agent, so while I took a look around Mogi laid out his personalised fourtharch bottles on the kitchen central work surface ready for everyone to see as they arrived – he was absolutely tickled pink. Bottles laid out, luggage dumped and hideout secured we had the afternoon free for a planned excursion to Hammersmith where I wanted to finally stand outside what was the Hammersmith Odeon so often tantalisingly glimpsed from the flyover and secondly to walk across Hammersmith Bridge whilst Mogi had the nearby Fullers Brewery in his sights. The highly decorative Hammersmith Bridge was designed by Sir Joseph Bazalgette who was also responsible for the creation of a sewer network for central London in the 19th Century, Sir Peter Bazalgette a descendant of the great man is today an independent television producer and responsible for the TV show Big Brother continuing a proud family tradition in the human waste industry. After walking back over the bridge then alone the pretty quayside we arrived at the nearby Fullers Brewery to find the staff in the middle of a company barbecue, Mogi dived into the brewery shop before our first treat of the weekend a pint of Fullers London Pride at the brewery pub – can life get any better? I took this down time as an opportunity to go over a few light hearted ideas for the next day’s Chairman’s speech with little idea that after nearly 15 years of attempts at humour Mogi would make a joke the next day – that was actually funny! It was now late afternoon and other members were beginning to arrive so it was time to return to project manager Steve’s schedule, we had agreed to meet at the Gregorian pub near the hide out so we headed back to Bermondsey tube station and sure enough sat in a very busy beer garden in glorious sunshine were Richard and Matt who had arrived by train for the short hop from Cambridge. Both Richard and Matt are fantastic husbands and fathers and very much love their respective families but Matt’s guilty pleasure over the weekend was going to be to sit down and read his Saturday Telegraph without someone chewing it at the corners and to actually find it again where he had last put it down, meanwhile Richard was going to drink as much beer as humanly possible! Mogi and I headed straight for the bar and for the first time in well I don’t know how long the young barmaid [yes, she was an Eastern European] asked us if we would like our beer in mugs, was this a sign or maybe a good omen for the fourtharch weekend because it was going to be a cracker of a trip. Next stop was the Mug House under London Bridge for the traditional Friday evening meal, on the way Matt and I happened to spot a fox in the gardens fronting those 1950s flats in Bermondsey, the little critter told us that he was looking forward to Jeremy Corbyn winning the Labour leadership contest the next day as foxes had done well since Blair, he then asked “Have you ever wondered why there are more pictures of missing cats stuck up on lamp posts these days darling? Before we had time to reply he quickly turned and disappeared into the undergrowth. It was good to be gathered around our reserved table at the Mug House for our Friday night meal mainly as a warm up and an opportunity to get to know each other once again and after the good omen of beer mugs at the Gregorian pub, pewter jugs of beer were now the order for the day as they arrived at our table, Richard asked if we could have pewter tankards to go with them, the waiter could only find 3 for now but supplied the table with lots more later. Mogi always on the lookout for a comedic opportunity spent the next 10 minutes making comments such as “A fine pair of jugs” and “These jugs are a good handful” sometimes I am not sure about his role as fourtharch equality and diversity officer. Last to join us and just in time to order food was new member Chris who played the trumpet at Richard and Claire’s wedding. The Mug House waiter looked awfully like Dudley Sutton [Tinker in Lovejoy] and seemed confused and as if about to drop various pieces of cutlery on the floor but as it turned out he only dropped a pot of mayonnaise on Dave’s arm, everything else including one of the best sirloin stakes I have ever tasted and for £20 in the centre of London was all brought correctly to the table single headedly and in good time. Night had fallen by the time we emerged from the Mug House under London Bridge but suddenly the whole vista opened up as we very soon found ourselves walking alongside the Thames with the bright lights of London in full view on the opposite bank. We were heading for the Anchor, the pub where Pepys observed the Great Fire of London, the place was a rabbit warren of staircases and floors and everyone was amused to see amongst the authentic period ceilings and tapestries a sign at the top of a staircase behind the bar for the Premier Inn. We all squeezed onto the first floor balcony where Pepys himself may have stood for a fantastic view of the old St Pauls Cathedral (the Norman one)– a perfect end to day one. I thought I would be the first up but as I made my way downstairs, remembering the house rule of no shoes upstairs, I found Gez in the kitchen preparing to leave for a pre-booked group run at the nearby Southwark park, I was heading out for some fresh air myself so decided to follow Gez and take some pictures of this new running phenomena. I got some good action shots of Gez but I failed to notice running amongst the many participants a local celebrity that Gez was very excited to tell us about when he returned to the house – for it was the recently deposed Liberal Democrat Simon Hughes – no LibDem conferences in a phone box jokes please. While we left Matt reading his Saturday Telegraph in the garden everyone else was gathered in the kitchen for the day’s first major decision – breakfast??? Being as we were the Bermondsey Mile Dogs we needed a suitable greasy spoon to spoof the scene in the actual Reservoir Dogs movie where they argue about tipping the waitress or in our case the uber taxi drivers [the result was not to] and for Mr Pink to complain about his assigned name or again in our case Mr Tickled Pink! Lou Farrow’s Pie ‘n’ Mash and Eels café around the corner on Southwark Park Road that Steve found was simply perfect and did what it said on the tin providing us very quickly with Lou’s special breakfasts that included builder’s mugs of coffee, door step size slices of buttered bread, a plate full of beans, sliced tomatoes, eggs and mushrooms covering rashers of bacon, sausages and that fried bread with the taste that can never be achieved at home – and all for £5.95 each. Lou also served up traditional London grub such as Jellied Eels and Pie in Liquor all listed on the large menu next to a mirror picture of the Millwall football club crest, Lou’s served all day breakfast was a perfect start for a day of sampling beer on the Bermondsey Mile. Steve received a message from his man Ralph who was casing the joint at Fourpure the first brewery on the Mile, he could not hold onto the table he was saving for us for much longer, Ralph was a colleague of Steve and a damn good find for he seemed to know everything and anything about beer and wearing his beer stalkers hat he would guide us through the Bermondsey Brewery Mile. As we said our goodbyes to Lou I noticed that fox again on the other side of the road this time with a bottle of champagne – looks like Jeremy Corbyn won the Labour leadership contest then. Previously on Fourtharch tours we have visited breweries situated in chocolate box cover, painting by numbers idyllic English villages so this year it was quite a contrast to be heading for the first of five breweries onto a trading estate. As we made our way by Screwfix and Toolstation it became obvious that something was happening for while all other estate businesses were closed for the weekend the Fourpure brewery housed in one of the units was most definitely open evidenced by groups of happy beer drinkers sitting on barrels or gathered around rubbish skips and pallet stacks, is it any wonder then that Ralph just about held onto our table as inside there were even more people wedged in between the paraphernalia of the brewing business, the brewery itself providing the perfect backdrop. We soon got down to the serious business of ordering and sampling the beer while prolific tweeter Richard got a Fourtharch tweet displayed on the large screen above the Fourpure bar – I never thought that I would ever say in the history of trading estates that this was a happening place – we were off, we were on the Mile, we are the Bermondsey Mile Dogs. The Partizan was the second brewery on the Mile and like the remaining three would now all be housed under the arches of the railway line heading into London Bridge, the advice was if you get disoriented, lose the horizon or forget who you are then simply head in the direction of the Shard, the building always in evidence at the end of the line. Unlike the trains the walk between each brewery was not a direct one so it was good to have our guide Ralph leading on ahead who at one stage seemed to gather even more followers almost turning into a beer crusade all the way down the appropriately named Bombay street. All the breweries were ‘rammed’ [I believe is the modern word] mostly with young people both male and female enjoying many choice beers, I notice there is a trend these days to place cafes and coffee shops in old shipping containers and the breweries under the arches with drinkers sat amongst the crates, pallets, gas bottles and stock seems to fit in perfectly with this new post-apocalyptic interior style, there was definitely a feel of revolution in the air. 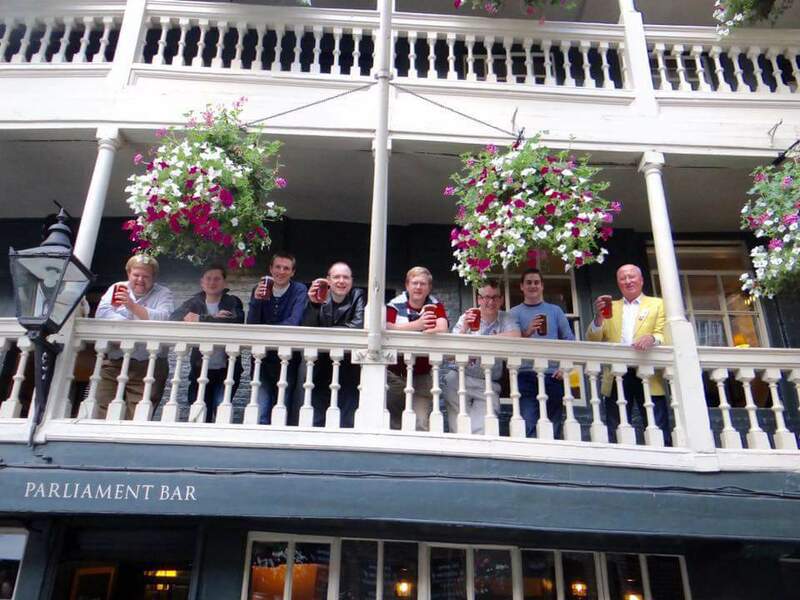 Our final brewery on the Mile was Anspatch & Hobday and from the new world of brewing, sampling and enjoying beer under the railway arches we all noticed an example of the old world just across the road – the Marquis of Wellington pub now sadly closed. We immediately assume that these old pubs are left abandoned due to the lack of business but it was beer expert Ralph who explained that the Marquis along with many other pubs had been bought by Punch Taverns and unfortunately for them, just before the property crash of 1988, the company simply holds onto the pubs, open or closed until their property values become profitable enough to sell – how sad. Everyone was now getting excited and the tension was building for it was time for our featured pub where the announcement for next year’s fourtharch tour would be made, we said our goodbyes to Ralph who told us that he might join us again later but first he was going to attempt the Bermondsey Mile ‘reverse’ this is the walk back down the line in the opposite direction that is fraught with danger as you no longer have the Shard to focus on should you lose the horizon, sadly Ralph did not return later and we can only hope that he made it or found refuge in the Bottle Shop. We decided to make our way to the George Inn on foot that once again took us through the colourful back streets of London, the city is packed with interest where ever you go and as Gez pointed out a new office block in Snowsfields and asked me what I thought I was far too busy enjoying the delights of the Miller pub opposite – a 1950s bad taste and style mix match extravaganza. As we neared the featured pub, Content Manager Mogi broke into a goosestep and demanded that before we do anything at the George “everyone vil gather for the group photograph holding a full pint of beer for the Fourtharch website” beer ordered, photographer found [the pub security man] photograph snapped we were soon sat around our table in a room to ourselves on the first floor that really felt like it was the Fourtharch boardroom. It is always a privilege to be invited to take the Chairman’s seat and I began thanking this year’s PM Steve for a very well organised and insightful weekend, we had one apology to mention that of new member Paul from Norfolk who unfortunately could not make it this time because of an injured leg but with hopes for next year. We then had input from our equal opportunities officer Mogi, finance and technical director Richard and the usual rounds of applause for Mogi, prolific tweeter Richard and top retweeter Matt. Dear reader you may not have noticed in all the excitement that one person who also happens to be next year’s Project Manager 2016 has been missing, young Rhys was suddenly called away on business to India just before this year’s fourtharch weekend, we were all disappointed not to have him join us again but business does come before pleasure, I was more than happy to be placed on standby as Project Manager for 2016 but would continuity necessarily have to be compromised? Richard called an emergency meeting with Matt and Mogi during the aforementioned joint family holiday in Yorkshire where the pressure was on for during deliberations Mogi was beaten up by the children and Matt excused himself 4 times to go and look for his Daily Telegraph [it was in the green bin outside Matt] The Yorkshire meeting concluded that young Rhys was to make his announcement as project manager 2016 at 6pm in the George Inn on Saturday 12th September 2015 whether in India or not – I was immediately stood down as standby as plans were put in place to make this happen – I think someone called Passepartout or David Niven should enter the scene at some point here. Back to the George and it was approaching 6pm, I had finished my chairman’s speech and handed over to Mogi to begin the process of making contact with Rhys in Bombay, we were all on tenterhooks as he produced his mobile already set to speakerphone and began to dial the STD code for India – suddenly a voice replied “2pm mate” he had called the house agent by mistake but dialling again he soon got through and after his Indian house servant handed the phone over, we heard the voice of Rhys for the first time that weekend. Mogi told us that there was no time for niceties and ordered Rhys to begin his proposal for 2016 – this was quite a double act from the two Morgan brothers for as we listened to Rhys making the announcement in his musically phrased Welsh rap style, elder brother Mogi held up visual illustrations in perfect sync for us all to see – I was reminded of the Bob Dylan song Subterranean Homesick Blues. Liverpool it is then for 2016 and the perfect contrast to the London weekend we had all just enjoyed and I knew it was going to be a hit because all members were now busy with their own mobiles checking the best way to travel to the once second city of the British Empire. We all shouted a big thank you to Rhys for liaising with us and for maintaining continuity but it was his Indian house servant who spoke next to wish us well for 2016 and to tell us that Rhys had to rush away to interview for a new chauffeur, then as if waiting near the door for all Fourtharch business to be concluded the young lady appeared to take our orders for food. “Bring fourth your best cheese platter please” to the slightly older waitress with the only authentic cockney accent we had come across for the whole weekend. We ‘av’nt got nun darling” was the reply and while Richard’s face turned ashen she explained that the very last tiny piece of cheese had been eaten by a very small person just that moment in the other dining area. I didn’t quite know how to take this explanation and would have preferred to have simply been told that cheese was off but I just wonder if the small person in the other dining area who had eaten the very last tiny piece of cheese just happened to be fox like in appearance and a supporter of the Labour party – but it couldn’t have been – could it? While Richard began to actually believe that “cheese was not possible” it was now a free for all, when members make suggestions for the rest of the evening and the winners were Matt for BBC Last Night at the Proms and Steve for the Star in Belgrave – the pub where the Great Train Robbery was planned. We took the underworld train to Hyde Park where it seems to be trendy these days to pass through station barriers with anything but a good old fashioned ticket such as credit cards and mobile phones, I might bring an iron to London next time and pretend to run that over the censors but for now I purchased a World is your Lobster card and we were away. Upon arriving at Hyde Park Corner we split into two groups, Richard, Mogi, Dave and Steve wanted more beer while your writer, Matt, Chris and Gez headed off for the Albert Hall, we were obviously not going to get inside the Hall but I think we all assumed that we could join in the celebrations, flag waving and singing gathered in the park outside in front of a large TV screen – apparently not. In the week that the BBC were objecting to the walls going up around Europe keeping migrants from Syria out they themselves built an even higher wall around what felt like the whole of Hyde park to keep British music loving, passport holding citizens out. There didn’t seem to be anyway of gaining access through the large entrances all patrolled by security men, finally we found a gap in the wall where a few other Londoners had gathered but spotting us a security man cruelly brought down a canvas tarpaulin to block our view to which a middle aged well-dressed lady groaned loudly and a black man shouted a rather unprintable expletive – at least we had the BBC’s favoured equality and diversity outside their wall. 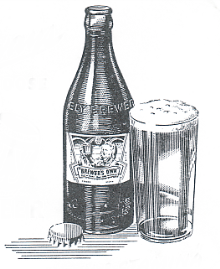 We hooked back up with the others and having been treated like vermin by the state broadcaster I was beginning to think that the Great Train Robber Bruce Reynolds maybe had a point and wanted to get to the Star and drink to his memory as soon as possible – or just get a drink. We discovered that the rich don’t come out at night as we walked towards the pub through the empty streets of exclusive Belgravia, the only action was the light spilling out from the expensive shop window displays onto the pristine big city houses all painted in high gloss white – you could smell the money and hear to the silence. The Star is in Belgrave Mews at the end of a row of old carriage house stables always found at the back of the big houses; the pub admits to its notorious past and makes play of it especially during the class revolution of the early 1960s when politicians were courting the pop stars [Harold Wilson and the Beatles] Royalty began courting celebrity and film stars such as Diana Dors, Albert Finney and Peter O’Toole were mixing with master criminals such as Bruce Reynolds in the Star. The pub was certainly a welcoming light after the deathly silence of the streets of Belgravia and upon entering an interior that had probably not changed since Miss Dors ordered her last G&T, the landlord greeted us with “You do know I am going to have to throw you lot out in 20 minutes” we immediately felt at home. The Great Train Robbery is now part of our social history but as you know it was after the heist that things began to go wrong, some members of the gang unable to resist spending the piles of stolen cash before the heat cooled down – the Bermondsey Mile Dogs had no problems in not spending cash – there was Mogi’s advance purchase bargain train tickets, the free uber cabs, the £300 compensation already in the beer kitty, £5.95 for breakfast, £40 each per night at Steve’s house and we even found some glasses to take back at Brew by Numbers to get the £3 deposit – Ronnie Biggs was born to early! Unlike the black cab drivers who always seem to know of a short cut through the back streets of London, our uber driver took us home right through the centre of the city giving us a great view of the Thames and the London Eye, as we made our way by Parliament Square tour guide Chris told us the reason for all the scaffolding up around the Palace of Westminster – I was listening Chris and more commentary in the future please. As everyone else headed for bed after a wonderful day, late night garden stalwarts Steve and Dave were the only ones up until 3am again, I asked Dave on the train back to Bristol the next day what they were talking about “Nothing really” that I guess was the correct answer. I thought I was the first downstairs again but no there was Chris in the kitchen with kettle boiled and kindly offered me a cup of coffee, it is always interesting to discover what new members think of the fourtharch weekend experience so I rather gingerly phrased a question come statement. 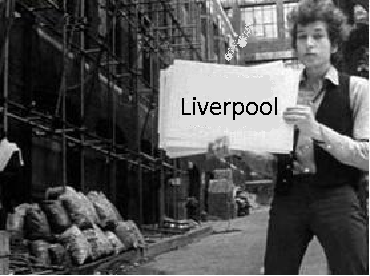 “Yes” he replied “and I shall be inviting my brother to come along – he’s got no excuse living in Manchester” I knew then that the idea was a good one and we now have not one but two more very welcome members. Finally not to be left out, if Rhys had been able to join us this time his name would of course have been Mr Purple Haze and for your writer’s – take a look at the pictures! More photo’s of the trip are in the album on our Facebook page.